The Low Down: The second book in the Matched series, Cassia is trying to maneuver herself so she can get closer to the Outer Provinces and try to find Ky. As the narrative switches back and forth between Cassia and Ky, we catch up with what has happened to both since the end of Matched. It’s not good, especially for Ky. Along with many other teens that have been labeled “Aberrations,” Ky is being used as a target in the Society’s war against The Enemy. Too many of these kids die swiftly and without a second glance from those in charge. As for Cassia, she is to be returned to the Central after her time at the work camp is over. On the last day, she finds a way to get on board the airship that she knows will take her to Ky. She finds out that Ky escaped a couple of days before with two other boys. Along with Indie, another girl from the work camp, Cassia presses on and dares to hope that she will find Ky. And the rebellion. Best Thang ‘Bout It: Sounding like a broken record, I know, but I am so pleased that this book was a good, solid story that can stand on its own. The second book in the series has to bear its own weight and not only be a continuation of the first book. It can’t only serve as a bridge to the conclusion, full of facts and catch-up. I am happy to say that this book swept me along in its quietly powerful way. I’m Cranky Because: Oh love triangles…where would be be without them? I know it’ll all work out in the end, but <sigh.> Both Xander and Ky are each awesome in their own way. If either of them gets killed off, or they have some sort of Hunger Games-ish conclusion, I will have my own quiet rebellion. I do have confidence that Ms. Condie will work this all out to the complete satisfaction of all of her readers. Yes. I know it. Should You? : Even though the Society says it raises your heart rate too high and it is not one of the sanctioned Hundred Books, sneak it under your mattress and read at night with a flashlight. So, yes. 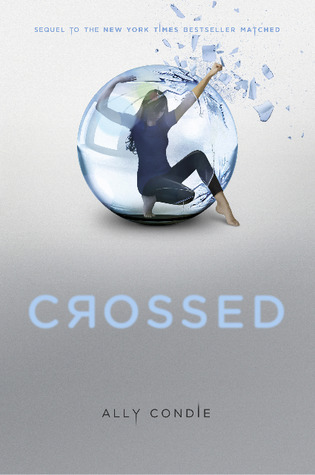 Crossed by Ally Condie was published on November 11, 2011 by Dutton Juvenile.